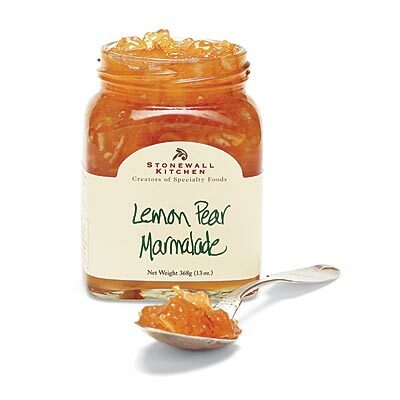 Stonewall Kitchen Lemon Pear Marmalade - Tart lemon rind & pear blend to create an exceptional flavor. Bursting with the flavors of lemon rind & sweet fresh pear, Stonewall Kitchen creates a marriage of clean sophisticated flavors. Warm Lemon Pear Marmalade & mix with soy sauce as a glaze for chicken. Use on grilled chicken or pork, with cream cheese & Urban Oven crackers, or add to your favorite sauce for lamb.